It is pretty rare to see talent, courage and a friendly disposition converge but that is exactly what you see when you meet Mohammad Sabaaneh. If you don’t know who he is, go to FB and check out his page. He is a brilliant political cartoonist and he just published a book of his work titled, “White and Black, Political Cartoons from Palestine” published by Just World Books. Why “White and Black?” because that is exactly what the situation in Palestine is like, clear cut evil vs. good, occupation and oppression vs. occupied and oppressed. I am not an art expert by any means but I know Palestine and I know courage. Sabaaneh’s art expresses the complexity of the Palestinian reality in an honest and unapologetic way. Sabaaneh’s cartoons cannot fit on a bumper sticker and they do not attempt to make simplistic statements. They are not a “Free Palestine” or “Smash the Occupation” type of cartoons but more like a little girl looking at a photo of her father and thinking to herself, “you have not been to my birthday, you have not given me a hug or put me to sleep. But I am not an orphan, I am the daughter of a prisoner.” In a harsh detail in one of his large, heavy with detail, Guernica type of cartoons a Palestinian child is nailed to the Star of David. The above cartoon fits well with another drawing which we find in the book where a baby goes directly from his mother’s womb to the coffin, the umbilical cord still attached. The world watches, some even hold a poster of the dead child, but nothing is done to prevent the Israeli brutality which makes this a reality. The recurring themes in Sabaaneh’s work are the Israeli soldier with a large head and dumb, distorted facial features. The prisoner who is mouthless, the mother who is always between an imprisoned or dead husband and the poor Palestinian child who is fatherless even when the father is alive. 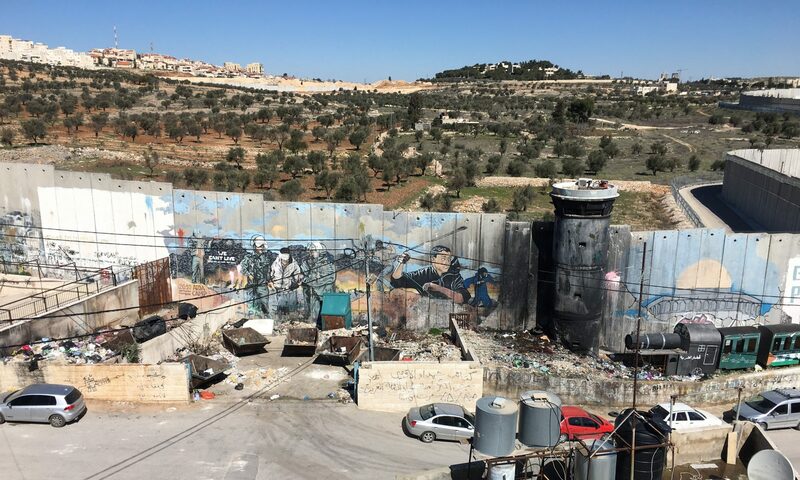 And all of these are deeply connected to the homeland, Palestine: occupied, defaced, dissected and in which there is no justice and no compassion. The Palestinian family, tied to the homeland connected to their home, their key. Yet somehow there is always a ray of sunlight in Sabaaneh’s work, a flower that manages to grow, a prisoner who manages to overpower his jailer, a child who holds on to the land. The suffering depicted in Sabaaneh’s work is real. It is raw and painfully real. One particularly painful piece Sabaaneh drew is of the boy prisoner Ahmad Manasara who received a twelve year sentence from an Israeli military court for a stabbing attack. He was called a 13-year old terrorist by the Israeli press. He was shot and left bleeding on a sidewalk as passers by cursed and beat him. Sabaaneh captured the moment that he was shot with a cartoon depicting a soldier shooting him and taking a photo on his phone at the same time. The boy was hospitalized for a while, chained to his bed at Hadassa hospital in Jerusalem. After his release from the hospital he was taken to police custody. A video of his interrogation found its way online. In the video the boy was repeatedly yelled at by his Israeli interrogators as he replied “I don’t remember, I don’t remember.” The following video shows both scenes. Sabannheh captured this in a cartoon as as well and as usual, took it even further. Sabaaneh spent time in prison and his brother Thamer has been imprisoned under administration detention countless times. Whenever Mohammad Sabaaneh crosses the border between Palestine and Jordan, he is held for hours by the Israeli security personnel who question him about his art. Once he was asked why he draws Israeli soldiers, to which he responded, “what do you see all around you?” Anyone who thinks there are are areas when it comes to Palestine, “White and Black” by Mohammad Sabaaneh is a wake up call, an expression resistance and a call to action for all of us to join the struggle for justice in Palestine. These two pieces were published by electronic Intifada. “One of the most disturbing aspects about the reality in Palestine is its normalcy.It has become normal to see Palestinians shot and killed, even children. The faces of young Palestinians showing up daily on social media, boys and girls shot by soldiers, accused falsely of attempting to stab a soldier.